Goodness And Abundance is a painting by Anne-D Mejaki - Art About You productions which was uploaded on January 15th, 2010. The Buhda of Compassion appeared suddenly after I began painting the temple. Like a knowing, I understood and accepted that something special was happening. 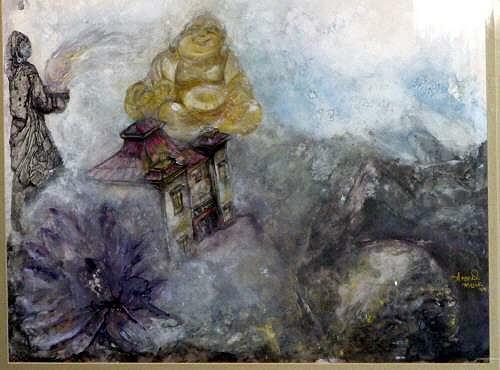 Without noticing, the composition began floating above earth and the Budha of Abundance took center stage. The Buhda of Compassion (far left) demonstrates goodness as she gives and receives the energy ball to and from the Budha of Abundance. Hi Anne - I like this piece too - how did busker fest go?